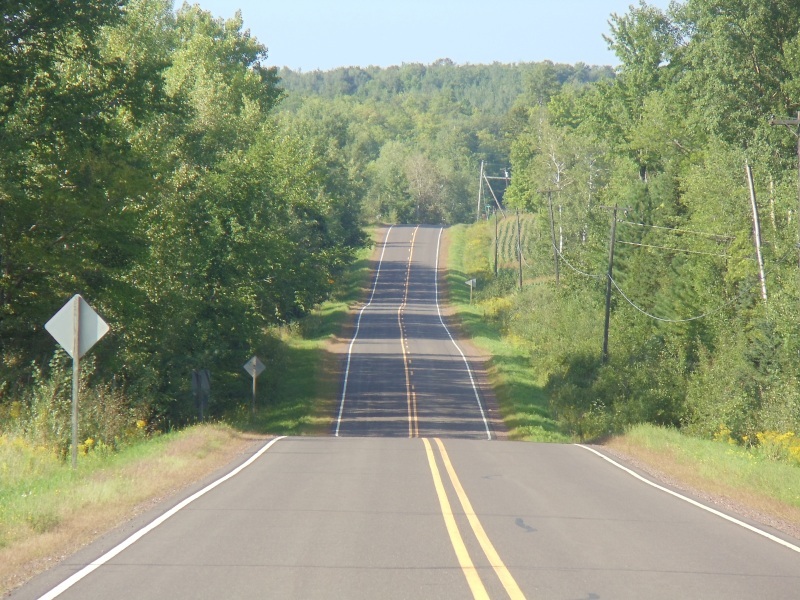 Quickie Summary: State “Trunk” Highway 169 connects U.S. 2 and Highway 13, two key routes in the North Woods, and provides access to the splendor of Copper Falls State Park and Potato Falls. The Drive (South to North): Highway 169 starts at Highway 13 on the north side of Mellen (pop. 935), with good access to Highway 77 as well. Mellen itself sports a charming city hall building, constructed the same year the largest tannery in North America opened here (1896). It would be seven more years before the telephone would come to town. 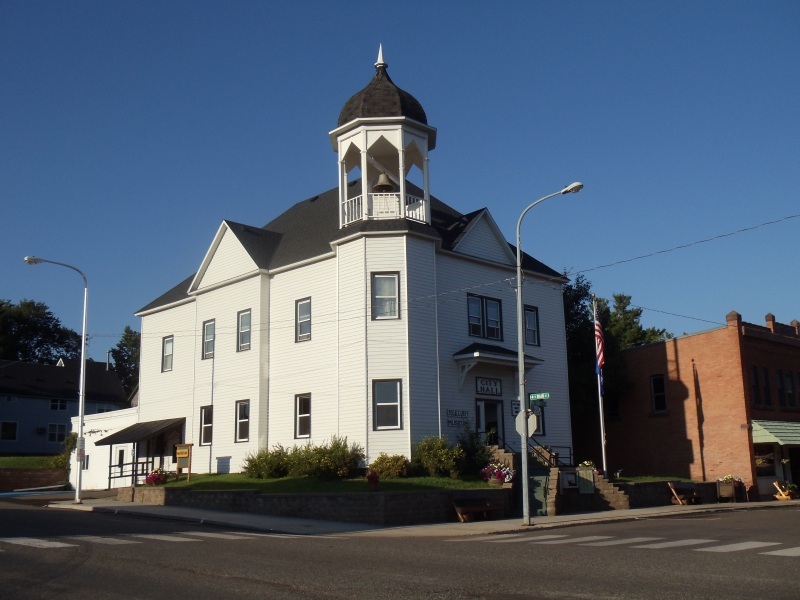 Mellen peaked in population around 1920 when it had almost 2,000 residents; however the tannery closed in 1922 and since then it’s been a small, pleasant burg that considers itself the Gateway to Copper Falls. Ernest Hemingway’s Adventures of a Young Man was filmed here in 1962, when the town welcomed the likes of Paul Newman and Jessica Tandy. Today, it welcomes recreational seekers of all kinds… but you can also catch a movie here if you want. Mellen’s beautiful City Hall. It’s just south of the start of Highway 169 along Highway 13. The northbound start of Highway 169, winding through the North Woods. Literally within a few minutes, you reach the entrance to Copper Falls State Park. 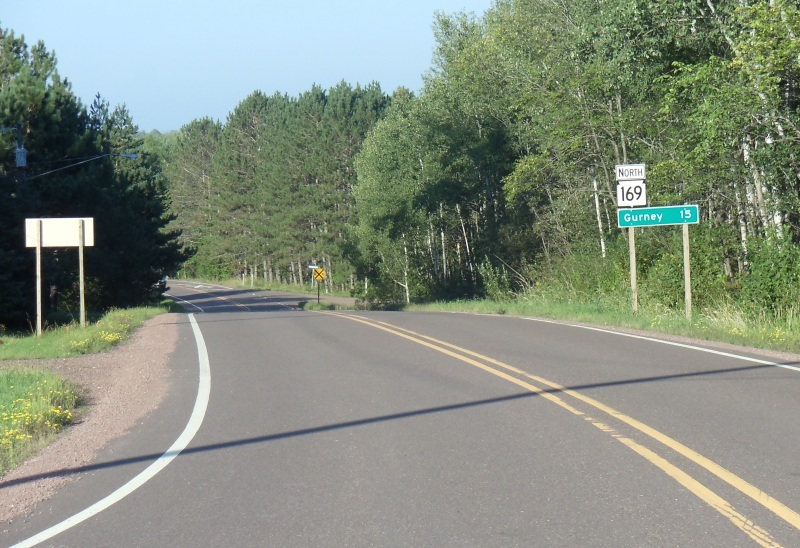 Less than 2 miles into Highway 169’s start from Highway 13 is 169’s key raison d’etre, the entrance to Copper Falls State Park. 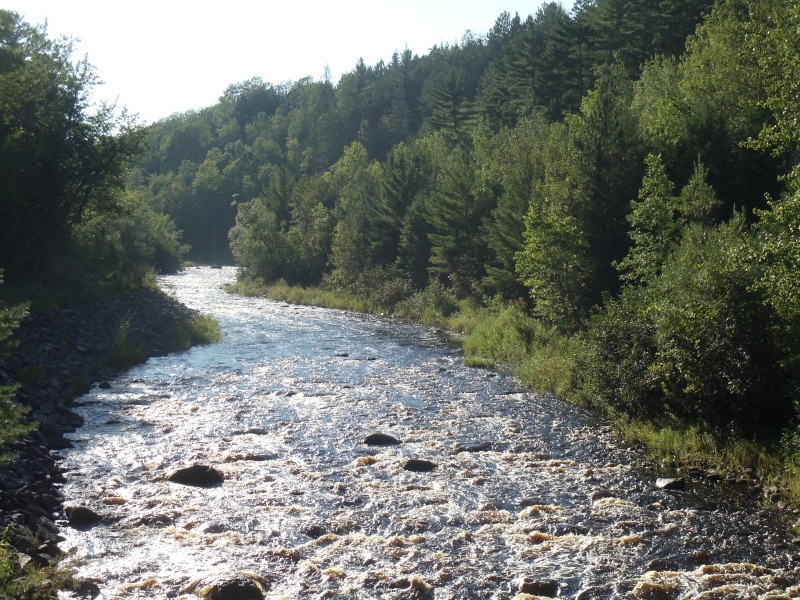 Considered one of the most scenic of all Wisconsin’s state parks – a tall order, indeed – Copper Falls features ancient lava flows, deep gorges, and some serious waterfalls. 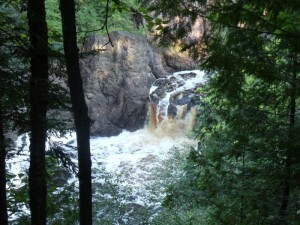 Brownstone Falls is one of the best in the state, as its the park’s namesake, Copper Falls. Campers have their choice of 54 sites, with additional group camping and backpack campsites. You’re in the midst of “snow country” here, with over 100 inches annually being the norm, so it’s generally safe in the winter months to assume the 8 miles of cross-country ski trails are maintained and ready. 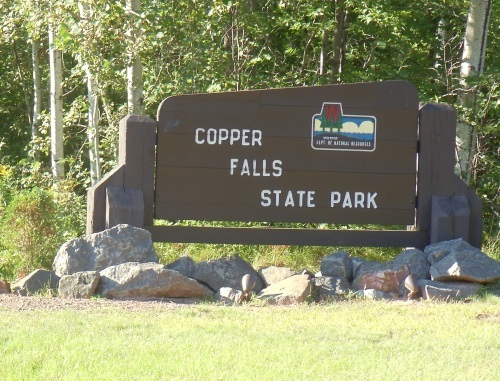 Copper Falls State Park was designated in 1929 and features a concession area, an observation tower (it’s a climb up two sets of long stairs and a hillside to reach), and miles of hiking trails. Over 100 inches of snow falls in this area annually, and eight miles of cross-country ski trails are maintained for winter use. A beautiful view can be had from the pedestrian bridge crossing the Bad River, including the picturesque scene here which any beer commercial would love to use. 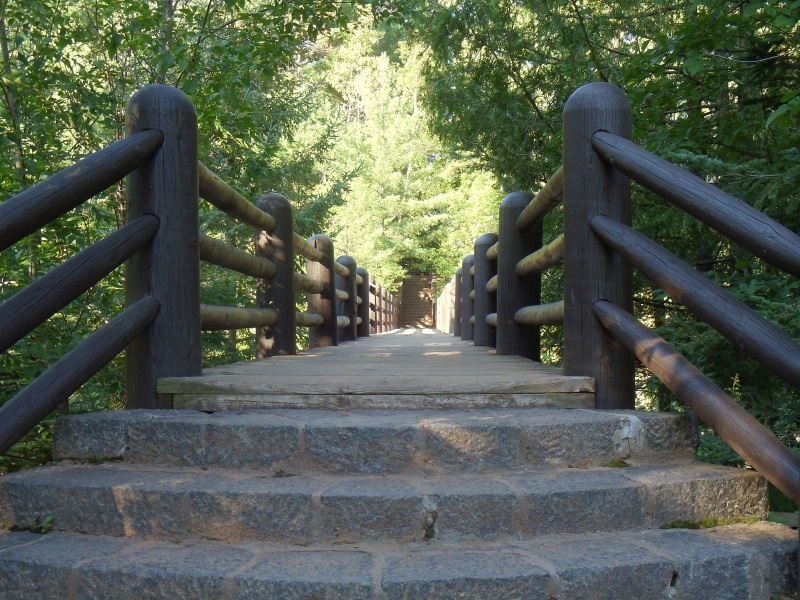 The park is connected on both sides of the Bad River by this handsome wooden bridge; crossing it, Copper Falls lies in one direction and in the other, a nice shot of rapids as the waters bubble over rock formations through the forest. Most pictures in beer commercials used to feature a scene like this, before the “partyin’ guys surrounded by bikini models” look took over. 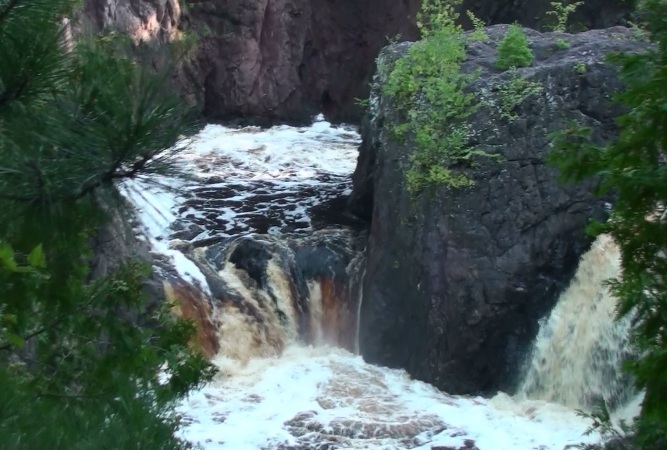 The park’s namesake once fell about 30 feet; erosion and “human activity” over the past century and change has caused it to become a 12-foot falls today, but nonetheless a beautiful, roaring sight. Beyond Copper Falls State Park, you head into Iron County and approach another great waterfall in the form of Potato Falls. 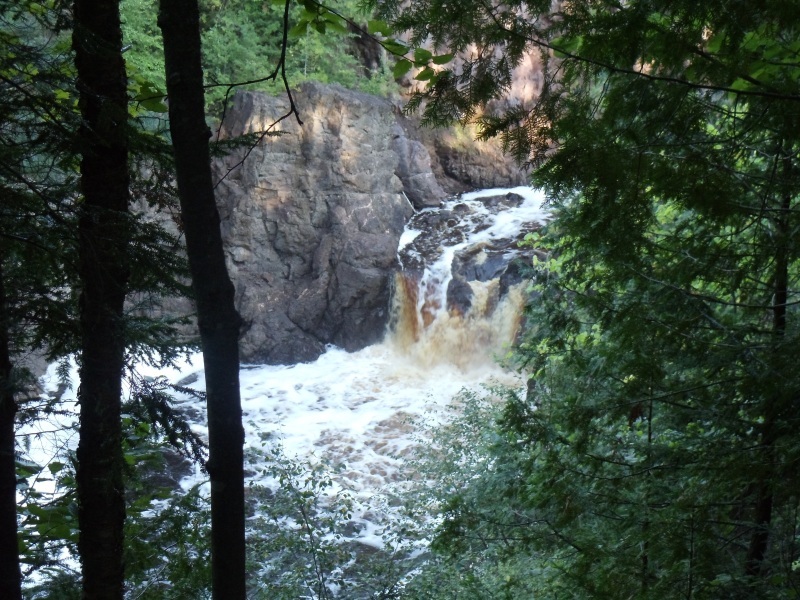 Located on the Potato River, Potato Falls features two 20-foot drops in the Upper Falls, with a series of boulders for dramatic effect in between. A few hundred feet down is the Lower Falls, a 30-foot drop. Definitely a must-see for waterfall lovers! Just beyond Potato Falls is the tiny settlement of Gurney (pop. 158) and then a junction with U.S. Highway 2, which is also the Lake Superior Circle Tour route. Ashland awaits to the west and Hurley lurks to the east. 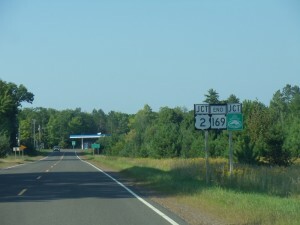 Highway 169 comes to an end at U.S. Highway 2, essentially the northern frame to the nation – because trees and Lake Superior are all that’s beyond here all the way to Canada. 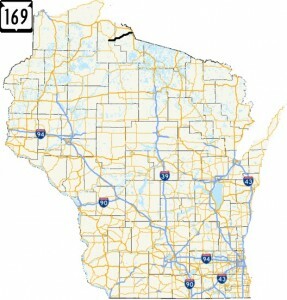 You can head east to Hurley and the U.P. 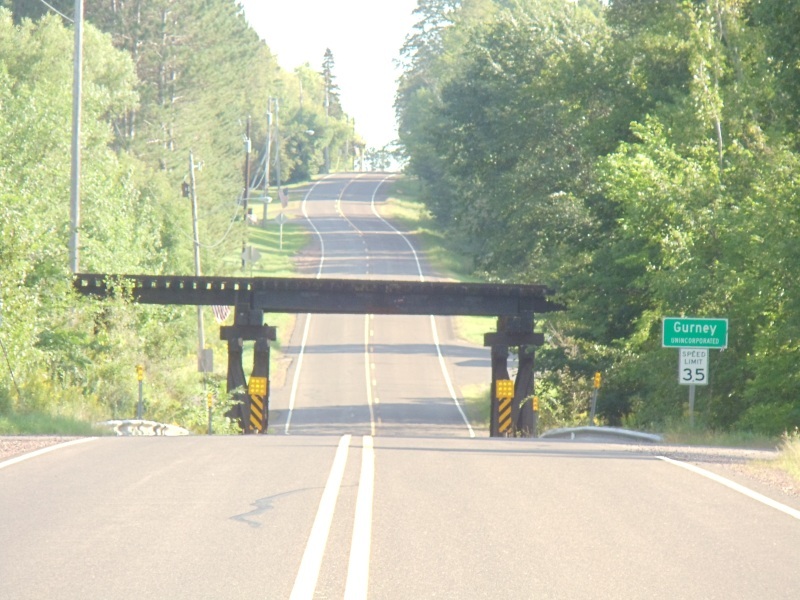 of Michigan, or west to Ashland or Superior – you can even re-join Highway 13 and head up to Bayfield. Heck, it’s all up to you, of course! 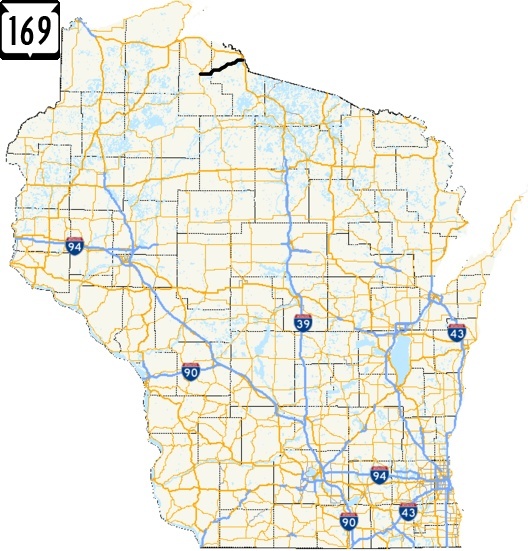 Highway 169 was commissioned in 1956. Copper Falls State Park, which the highway mainly services, was established in 1929.